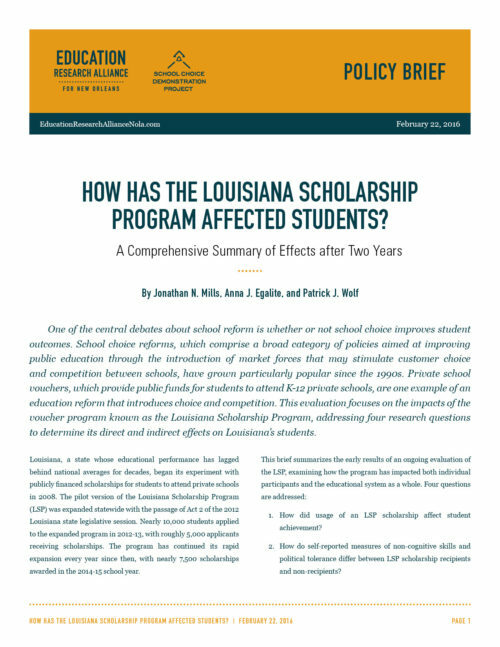 A policy brief by Jonathan N. Mills, Anna J. Egalite, and Patrick J. Wolf summarizing four accompanying technical reports on the affects of the Louisiana Scholarship Program. How Has the Louisiana Scholarship Program Affected Students after Two Years? One of the central debates about school reform is whether or not school choice improves student outcomes. School choice reforms, which comprise a broad category of policies aimed at improving public education through the introduction of market forces that may stimulate customer choice and competition between schools, have grown particularly popular since the 1990s. Private school vouchers, which provide public funds for students to attend K-12 private schools, are one example of an education reform that introduces choice and competition. This evaluation focuses on the impacts of the voucher program known as the Louisiana Scholarship Program, addressing four research questions to determine its direct and indirect effects on Louisiana’s students.